We are looking back to the very beginnings of climate reporting in the Portland area, circa 1874. If interested in Portland's recent severe winter cold waves, click here. Tidbit: 1888 was one of the most brutal winters ever experienced in the Portland area. The mean temperature for January 1888 was an even 22.0 degrees F, which is 16.1 degrees below normal, equivalent to raising the city to 4800 feet-- the elevation of Santiam Pass! Other historic records indicate that December 1884 had very deep snows followed by subzero cold and huge losses of livestock and other damage, and was remembered as the "worst ever" for many decades later. Tidbit: Frozen Rivers! There are several instances in the historic records of the Willamette and Columbia Rivers freezing over, with ice jams and icebreakers at work on the rivers to keep the Port of Portland open! There are even pictures of cars being driven across the icy Willamette River in downtown Portland, eg. December, 1924. Even far to the south of Portland, The Oregonian newspaper noted on Dec. 24 that the Willamette River was frozen to the depth of seven inches in Eugene! 1933 also froze the Columbia, and may have been the most recent occurrence of this. The winters of both 1949 and 1950 provided residents with two back-to-back horrific winters, which shattered many records, combining both extreme cold and deep snowfalls. Most of those marks were so extreme that they are still easily standing today, eg. in the extreme cold category, the average daily low in January 1949 was 21.0 degrees, and in January 1950 it was 21.2 degrees, both breaking the old "coldest month" record that had been set in 1888, and both marks still standing tall in 2016 as "coldest ever." Since 1950, the only cold even approaching these records was January 1985, when the mean monthly temperature was 26.8. But in the cold category, the really outstanding events of Winter 1950 were two out of the three times in history that Portland has been below zero! Portland's all-time record low was set on February 2, 1950 at 3 below zero. Salem's second-coldest all-time low of 10 below was set on January 31, 1950 (Salem's absolute lowest is 12 below). Deep and long-lasting snows! The winters of 1949 and 1950 gave stunned residents the experience of living in true "Snow Belt" cities, with weeks-long snow on the ground, and many very cold days with snow deeper than 10 inches on the ground....January 1950's snowfall dwarfs modern contenders, with an awesome 41 inches falling during the long, cold month (the much-touted heavy snows of Decemer 2008 totalled only about half of 1950's)...... Also of interest regarding the winter of 1949 is the little-known fact that a very unusual early-season cold invasion occurred approx. October 19-21, 1949, setting all-time record lows for the dates that in 2009 have still not been beaten-- such low temp. records are found for cities ranging all up and down the West Coast, from Olympia, WA (23 degrees), to Portland, Oregon (27 degrees), to Medford, Oregon (20 degrees), to Sacramento, Calif.(35 degrees)-- and even as far south as Douglas, Arizona on the Mexican border (31 degrees)....This type of major cold air invasion was similar to the range and power to the Siberian Express of February, 1933, which set all-time cold records across several States that have never been beaten. It was also similar to the freak Nov. 15, 1955 cold wave that pushed Olympia, WA to zero degrees establishing a record that still easily beats its closest contender since. The Big Picture of Historic Long-term Portland Snowfalls, compliments of Steve Pierce, AMS: During the period of 1871 to the present, Portland's all-time records for snowfall include, at number one, the winter of 1892-93, with 60.9 inches of snow.... The winter of 1949-50 came in third with a total of 44.5 inches, while winter 2008-2009 is (as of January 14) only in 20th place, with a total of 21.3 inches. Within the past ten years, the next-highest contender was the winter of 2003-2004, with 12.3 inches. Global Warming is highly suspect in a long-term analysis Mr. Pierce did of Portland snowfall by decade, beginning in 1871. That analysis showed a pronounced and steady decline in Portland snowfall over the period from 1871 to 2010. The earliest decade having 183 inches of snowfall, while the 2000-2010 decade recorded only 45 inches, a four-fold decrease, and one which clearly supports the unscientific "feelings" of many Portlanders oldtimers that their city rarely gets any significant snow anymore. (January, 1950) "Temeratures over the entire State were far below normal, and precipitation was much above. The major portion of this precipitation fell in the form of snow and sleet even in the western division (eg. Willamette Valley). In Portland a total of 32.9 inches of snow fell during the month (41 inches at the Airport)...Severe blizzard conditions on the 13th and a heavy sleet and ice storm on the 18th-19th together caused several hundred thousand dollars worth of damage and virtually halted traffic for two or three days over widespread areas, particularly in western Oregon...." George Taylor adds, "...All highways west of the Cascades and through the Columbia River Gorge were closed due to large snow drifts." (First quote is from the 1950 Annual Climatological Summary, written by E.S. Ellison, and second quotation is from The Oregon Weather Book by George Taylor. ) And Portland was mild compared to what was happening eastward up the Columbia River Gorge, where the cold and snow were worse yet, with Cascade Locks buried under 92 inches of snowfall for the month, and the town of Hood River nearly shut down with 94 inches. Further east up the Gorge, the normally semi-arid town of The Dalles saw an unbelievable 76 inches fall during the month. 1968-69--- Finally, bringing us to a more recent time, let's not forget the winter of 1968-69. This winter featured a brutal double-whammy of snow in late-December-January.... In total there were 18 days with one inch or more of snow on the ground, with snow up to 9 inches deep during the first period, and up to 10 inches deep in the second! Kids were in heaven and snowmen almost out-numbered people by the time the long snowy period ended.... While temperatures were not as extremely cold as in either 1949 or 1950, they were substantially colder than Portland's Ice Storm of 2004. eg. Dec. 30, 1968 had a high of 14 and a low of 8, and Dec. 31, 1968, had a high of only 19 and a low of 9 degrees; in contrast, the coldest recorded during Ice Storm 2004 was a comparatively mild 18 degrees....Overall, winter 1968-69 ended with a total snowfall of 34.0 inches, ranking it in the Number 9 spot since records began in 1871..... Also of note, and more recent yet, was the cold wave of Christmas 1978, which extended also into early January 1979. December, 1919. Apologies to all other contenders, but December of 1919 is still the Grand-daddy of winter storms in Oregon--- the year still holds various records for both extreme cold and for deep snow! What may be Oregon's record for "The most snow in 24 hrs. in an actual town" was probably set on December 10, 1919, when 40 inches smothered Parkdale, a small town in the apple-growing region above Hood River. Also of note was Parkdale's 63 inch storm total from the three-day storm. Completing the horrendous winter picture, very severe cold in arctic outbreaks hit the State, especially on around Dec. 11-16, and weather observers of the time noted that the Columbia River was frozen and winter had not even arrived yet!.. December 13, 1919 saw Austin at 41 below zero, and the same date saw Pendleton shivering with 28 below (which is tied with Feb. 1929 for that city's all-time record low). Overall, winter 1919-1920 saw only 19 inches of snow fall in Portland itself, but it stayed on the ground for a very long time due to the frigid temperatures. In contrast to Portland, nearby Forest Grove was really clobbered by heavy snowfall--- a single 48 hour period (Dec. 9-10) saw 25 inches of snow fall-- dry, light stuff, and then temperatures went sub-zero for four days, as low as 15 below! In over 90 years since, no storm of such magnitude has struck Northwestern Oregon (deep snows, extreme cold, and long duration). Has Global Warming been the Culprit? 1990-- the last really cold December recorded in Portland. Coldest day had high of 20 and low of 12. 1983-- but Christmas-time 1983 will long be remembered as much worse than 1990. For many days the east winds whistled at consistent 40-50 mph, while episodes of rain, snow and fog messed up all transportation. Temperatures for the 12-14 days of the cold wave were not quite as cold as what would occur in 1989, but with the extreme winds were brutal, eg. Dec. 23 with a high of only 19, a low of 12, and winds gusting to 48 mph! 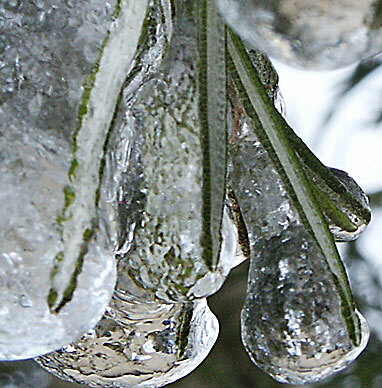 This cold wave featured a terrible ice storm that began on Christmas Day and lasted for the next several days. Could not have been worse timing by Mother Nature! 1980-- the last really cold January recorded in Portland. Coldest day had high of 32 and low of 13. Earliest mid-70's temperature: March 13, 2005, 75 degrees, during a long spell of nearly cloudless similar days! Earliest mid-80s temperature: April 26, 1947, 86 degrees. Earliest 90 degree temperature: April 30, 1998, 90 degrees. Latest mid-80s temperature: October 11, 1991, 86 degrees. Latest 80 degree temperature: October 15, 1991, 80 degrees. Latest 70 degree temperature: November 13, 1991, 71 degrees. Earliest frost: October 8, 1985, 32 degrees (Seneca was 4 degrees!). THANKSGIVING COLD: Cold Wave of November, 1985---- in Western Washington, Olympia had lows of zero, two days in a row, Nov. 22 and 23, a real frozen turkey time! Meanwhile Portland recorded an cold but unremarkable 17, while Seattle had a chilling 10 degrees, and east of the Cascades Yakima was 13 below zero...Oregon's Arctic King, Seneca, fell to 31 below zero during this early-season cold wave event.